Does the properties removal option in Windows Explorer remove all metadata? 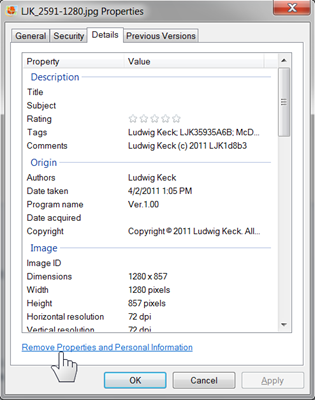 The option “Remove Properties and Personal Information” on the Details tab of Properties can be used to remove data. It does not remove all data. When the link is clicked another dialog “Remove Properties” opens with detail choices. 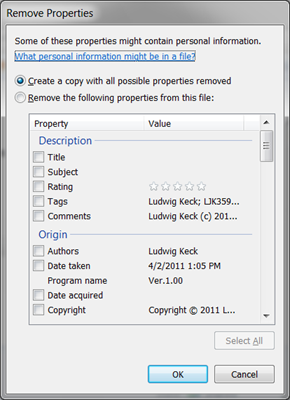 The options are: “Create a copy with all possible properties removed” and “Remove the following properties from this file:” The second option allows specific data to be selected for removal. In either case a copy of the file is produced. The new file will have a variety of the properties still in the file. 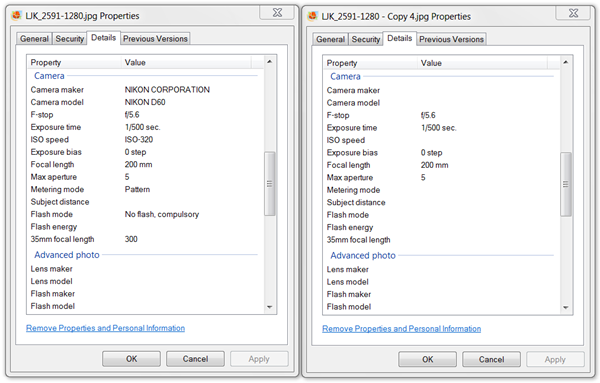 For the example of a dogwood blossom photo used here to illustrate the process, a number of data items remained and can still be seen in Properties. Some other data that is not shown in properties also is still embedded in the file. Do not rely on this tool to clear all metadata. When I want pretty much all data removed, I open the photo in Paint, select all of the photo and copy (Ctrl-C) the selected area. I then paste it into a new Paint window and save the result. For just one or a few photos, that is a faster method than using a special tool. Metadata: There is more in your photos than meets the eye!